Læg mærke til hende den libyske kommisar med hammeren…. Story covered in French satellite TV France 24; Swiss TV; The New Republic online…. Libya was chosen in 2007 to chair the preparatory committee for the UN Durban Review Conference–notwithstanding the irony of an egregious human-rights violator chairing a human rights conference. For the past three days, the committee has been holding sessions to finalize the conference’s draft statement, upon which many countries will base their decision whether to attend the conference this week. On Friday, the last day, NGOs were given 30 minutes to weigh in. But sitting in their chair was not Hillel Neuer, the group’s executive director and usual mouthpiece, but Ashraf El Hagog, the Palestinian doctor who was falsely accused of and sentenced to death for infecting hundreds of Libyan children with HIV (along with five Bulgarian nurses). El Hagog and the nurses were held in Libya on death row for nine years, mistreated and tortured, until their release was negotiated by France last year. Al-Hajjaji immediately started banging her gavel. “Stop… stop…. I ask you to stop,” she yelled, first looking miffed, then exasperated. “You are, you are not addressing the agenda item… I will allow you to resume only if you address the agenda item we are discussing.” The room immediately fell silent. At this point, Hajjaji recognized a point of order from … the Libyan delegation, who said that El Hagog was not speaking on the correct agenda item. Hajjaji used the objection as an excuse to move on to the next speaker. I dagene fra den 20. til 24. april 2009 frygtes et flertal af landene i FN anført af Organisationen af Islamiske Lande (OIC) at rette et så ødelæggende anslag mod Menneskerettighedsdeklarationen, at den, hvis de måtte få held til deres forehavende, reelt vil miste sin værdi, og de Forenede Nationer de facto være frataget sin eksistensberettigelse. Konferencen i Genève næste forår skal følge op på “Verdenskonferencen mod racisme, racediskrimination, fremmedhad og relateret intolerance” i 2001 arrangeret af FN’s Menneskerettighedsråd i den sydafrikanske havneby Durban, der er en skamplet på FN’s allerede ramponerede renommé, som det endnu ikke er lykkedes at viske bort. USA og Israel udvandrede fra konferencen, der undervejs stemplede Israel som en apartheidstat, ligestillede zionisme med racisme samt nedtonede betydningen af det nazistiske folkemord på jøderne under Anden Verdenskrig. The Swiss government has nominated Jean Ziegler — co-founder of the “Muammar Khaddafi Human Rights Prize” — to represent the Western world as an expert at the UN Human Rights Council. Mr. Ziegler has supported Castro, Mugabe, Mengistu, Chavez, and other repressive rulers. 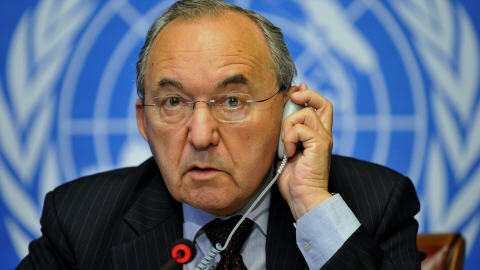 He grossly abused the mandate of a previous UN post to pursue an extremist political agenda. Take action to stop this outrage. Send a message to Switzerland’s president and foreign minister, urging them to immediately cancel the nomination of Mr. Ziegler. Act Now: The election will be on March 26, 2008. Man kan sende en petition herfra. Filed under: menneskerettigheder, UN | Tagged: Jean Ziegler, UN Watch |	Kommentarer lukket til Take Action! An emergency session today of the UN’s 47-nation Human Rights Council condemned Israel for “grave violations of the human and humanitarian rights of Palestinian civilians,” for “undermining” the peace process, “incessant and repeated Israeli military attacks,” and causing “loss of life and injuries among Palestinian civilians, including women and children.” The resolution, which made no mention of Hamas rocket attacks or their Israeli victims, was adopted by 30 votes to 1 (Canada), with 15 abstentions from European Union and other countries. UN Watch thanks the many hundreds who urged world leaders not to support the biased and counter-productive text. Interessant, at det er Syrien, Libya, Iran og Cuba, som har taget initiativet til denne session. Hykleriet kender ingen grænser.